6-Pack Bottles 7-Up, Diet Rite, Vernors or Sunkist - Buy 2, Get 3 FREE! **Purchase any 2 Brita or Clorox Green Works Products, get $2/00 off INSTANTLY! Spartan Split Chicken Breasts, Drumsticks or Thighs $0.99/lb. Total = As low as $1.33 each wyb 10 & get 2 free! Total = $2.49 for Detergent & Wipes! *there have been reports that this bacon is producing the monthly $1 RR wyb two! Let us know if you get one! Final Cost: $2 Moneymaker (or $1)! *Register with Nature's Bounty Rewards and enter your UPC's for $5 Overage! On page 7 of my Home Depot ad it says that you can get a FREE faucet aerator if you are one of the first 200 people in store today. 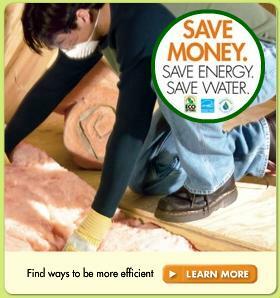 Great for water conservation & to kick off Earth Week! Did you know that if you turned off the water while you brush your teeth you will save an average of 4 gallons per minute? That equals out to be about 200 gallons each week in a family of 4. Thanks to Jodi for the heads up on this! Visit Target on 4/18 and get a free reusable bag with any Tide, GE or Coke purchase. 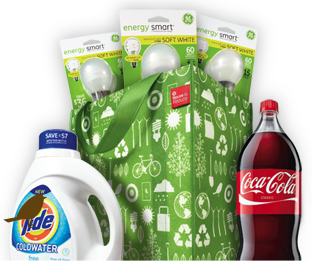 There are some great printable coupons on Target's website for B1G1 Coke 20oz and $2 off GE Energy Smart Light Bulbs. Print them for this deal before they're gone!